Day 5! 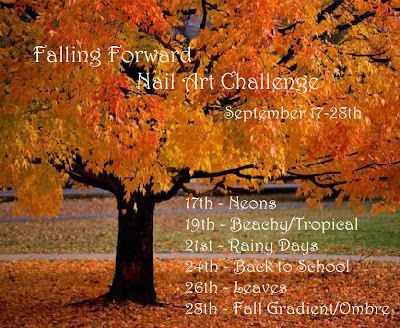 One more day and our fun little challenge is over! Kind of makes me sad! I decided to have some fun with sponging, with the fall color of leaves. Im not totally happy with today's mani... but its not horrible! I started with a yellow base, then sponged the orange and finished it with the maroon. I used Avon Nailwear Sunshine and Tangtastic and Zoya Toni. Then I hand drew the leafless tree with e.l.f. cosmetics Smokey Brown. Be sure to check out the other awesome bloggers joining it! Such pretty colors...it kind of looks like fire! I actually really love this! The tree is an awesome addition! Wow! I love the sponged effect! It really looks like falling leaves swirling in the cool breeze. Just beautiful!